Twitter issued a temporary ban on Missouri Senate candidate Austin Petersen one week before Republican primary elections after a mass-reporting campaign led by a progressive organization. For 12 hours on Monday, Petersen could not tweet to his 58.7 thousand followers during a crucial period before the GOP primary election on Aug. 7. The candidate is proactive on Twitter, often communicating with his followers and retweeting them. Twitter suspended Petersen for what it described as “abusive behavior” after he tweeted that his campaign accepts bitcoin donations, according to a Facebook post from Petersen’s official page. 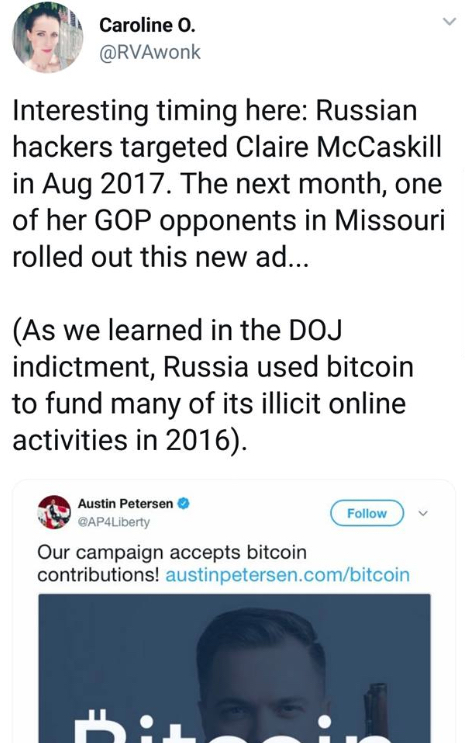 The liberal organization ShareBlue and activist Caroline Orr attempted to draw a connection between Petersen accepting bitcoin donations and the alleged Russian hack of Missouri Democratic Sen. Claire McCaskill. Petersen’s potential Democratic opponent in the general election — if he wins the primary — would be incumbent Claire McCaskill, who has raised over $22 million. The Senate race is in a state that President Donald Trump won by nearly 20 points. This isn’t the first time a social media giant has blocked Petersen from posting. Facebook issued a temporary ban on the candidate for giving away a free AR-15 in September. A Twitter spokesman told The Daily Caller News Foundation in an email Tuesday that the company does comment on individual accounts for privacy and security reasons.